A snakelike reptile, the Pachyophis is possibly an ancestor to modern day snakes. It may even have been the first snake! Our replica captures all the detail of the rare and magnificent original specimen. 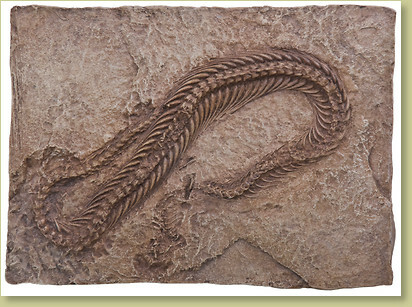 With more than 100 vertebrae and pairs of ribs, this specimen would be 21 inches (53 cm) when it uncoiled. Credit The original specimen is in the collection of the National Natural History Museum in Vienna, Austria.